For centuries bicycles have been man’s leading means of transportation. With world-wide problems such as automobile traffic congestion and related greenhouse gas emissions, bicycle demand will only continue to see a high level of growth. Daymak’s proprietary technologies make ebikes an attractive commuting and recreational alternative. The “Daymak Drive” controller brings to the ebike industry a higher level of performance than currently exists. 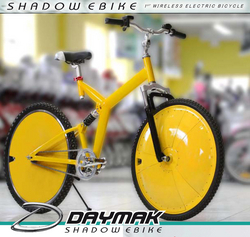 Now, Daymak, with the introduction of the Shadow Ebike and its proprietary wireless technologies, is pushing the bar even higher. Whether consumers ride to live or live to ride, the Shadow Ebike will deliver the world’s best riding experience. Shop Ebike for LE$$ / Products list Click here!